We’ve all heard that if we’re dieting or simply watching our weight, it’s best to avoid snacking in the morning unless you’re absolutely hungry. (Try distracting yourself with a drink of water or a stick of sugar-free gum.) Research indicates that there is a connection between snacking between breakfast and lunch and slower weight loss in some dieters1. If you absolutely must snack mid-morning, limit yourself to a single piece of fruit to keep calories below 100. A banana or pear has about 100 calories, an orange has 60, and a peach has 40 calories. Dried fruit also works, but the portions have to be smaller: 8 dried apricot halves, 3 dates or prunes, 2 Tablespoons dried cherries, or 1 Tablespoon of raisins. 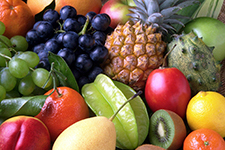 Fruit is a good snack choice because it also contributes dietary fiber. 1 Kong, A., Beresford, S. A., Alfano, C. M., Foster-Schubert, K. E., Neuhouser, M. L., Johnson, D. B., et al. (2011). Associations between snacking and weight loss and nutrient intake among postmenopausal overweight to obese women in a dietary weight-loss intervention. Journal of the American Dietetic Association, 111(12), 1898-1903.